Editor's Note: This post was updated in March 2014. For the latest sales on dresses and other garments, visit On Sale. 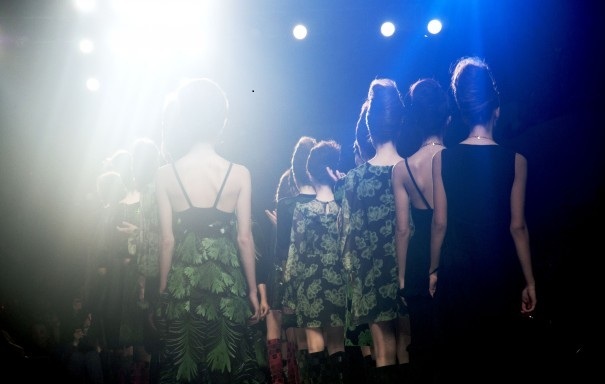 Did you see any of the live streaming of runway shows during Fashion Week in New York City this month? I watched a few and got a kick out of "the scene." The thing that really struck me was the variety of designs, not only from designer to designer, but even within a single designer's collection. When I read the fashion magazines, I'm led to believe that there are definitive trends dictating the season's fashion. I think fashion editors focus on certain trends because there's no way they can cover the collections of all designers--there are way too many. But the truth is, there are lots of different styles each season. That's good news for women over 50 who are looking for fashions to flatter their age and body shape. Here's a sample of dress trends for Spring 2014. Structured dresses, such as wraps or sheaths, are often a flattering choice for women over 50 because it defines the female shape. 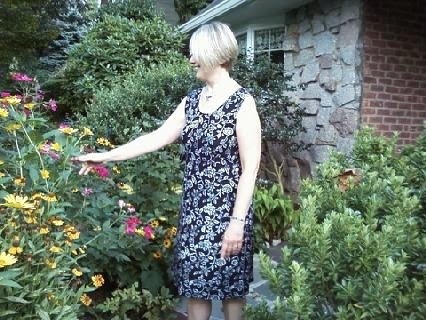 Here's one of my over 50 girlfriends modeling a navy and white floral sheath. Navy and all shades of blue are very "hot" this spring. Here's a Women's Regular Sleeveless Pattern Ponté Welt Pocket Dress - Navy Storm Floral, 6 ($79) from Land's End. it's a sleeveless floral sheath like my girlfriends, available in Regular, Petite, Tall, and Plus sizes. The bright cardigan offers the perfect coverage for over 50 arms. It's impossible to talk about spring 2014 without addressing stripes. In New York, stripes have been huge this past year and they're still going strong. Here's a great Anne Klein Belted Dress ($99) that captures both the stripes and colorblocking trends. I'm loving all the lace sheaths, like this Adrianna Papell Lace Overlay Sheath Dress (Regular & Petite) ($138). Dress Length: 39". This spring's "fit and flared" dresses are a comfortable choice for over 50 women, especially those with a "pear-shaped" body like mine (above). These dresses are fitted around the torso, where the "pear" is thinnest, and then fan out over the hips and bottom. Land's End ~ I'm loving this new Women's Regular Elbow Sleeve Pattern Cotton Modal Fit and Flare Dress - Blue Indigo Floral, XS ($59) for spring. Vintage prints are very much in vogue. The regular hem is 38". It's available Sizes XS to XL, as well as in Petite and Plus sizes. Dresses with prints--stripes, polka dots, color splashes, geometric designs--are everywhere this spring. I'm a huge fan of prints because they hide our little lumps and bumps. In the photo above, I'm wearing a print wrap dress from Coldwater Creek, which I got last year. Wrap dresses, which are a flattering choices for most body shapes, are everywhere. Just about every clothing company offers one or two wrap styles. I love this Long Sleeve Shapely Anywhere Dress - EMERALD ($94.95). By the by, emerald green is a "hot color" this spring. Orange is also making a comeback this spring. Here's a very comfortable print dress with 3/4 sleeves. The tie front on the Jones New York Print Jersey Sheath Dress ($98) (below) offers a bit of tummy distraction. What To Do With Floral Shoes? Good-bye, Scarf. Hello, Beaded Necklace! Fashion 2011: Let Your Sign Be Your Guide? Spring 2011: More Denim, darling! Style Over 50: Back Away From Black?